Could Michael Rucker Be a Bullpen Sleeper for 2019? The off-season is the perfect time to evaluate the Cubs’ minor league system and the direction certain players are going. Player reports can be perused, video can be watched, but it’s hard to ignore a guy who throw strikes 70 percent of the time. Over the past year, the Cubs have seen a lot of change to their bullpen. Considering the number of free agents the Cubs have this winter, the Cubs are going to be looking for more depth come 2019. While Dillon Maples and his wiffleball arsenal pop out first, there are other arms like Dakota Mekkes and James Norwood who come to mind. However, a name that could come up as a possible bullpen arm isn’t even a bullpen arm right now. Michael Rucker was selected in the 11th round of the 2016 MLB draft. He started out that summer in the bullpen at Eugene and begin 2017 in the bullpen in South Bend. He was extremely impressive in the Midwest League throwing 67 percent of his pitches for strikes. He usually sat 95 to 96 most games and just dominated; first as a setup man and then later at the back end of the pen. A quick promotion to Myrtle Beach saw him continue to pound the strike zone at 68 percent strikes. However, fortunes do change. An injury to Oscar de la Cruz pushed Rucker into the rotation for the Pelicans. With his ability to command his pitches in the bottom half of the zone, Rucker wound up staying in the rotation the rest of the 2017 season putting up some studly numbers in the second half in 12 starts with a 2.51 ERA. At one point that summer, I referred to him as a guy who could be a guy. This year, Rucker threw at Double-A Tennessee. 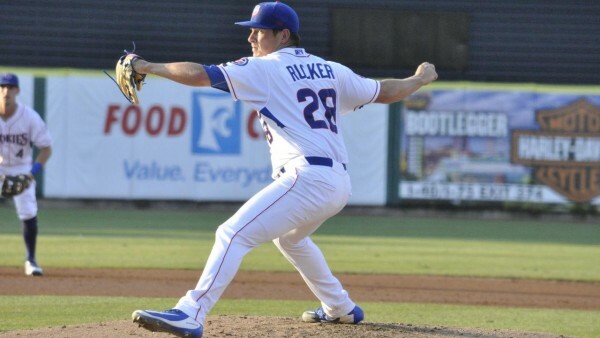 Rucker was an anchor for the Smokies in the starting rotation. There were many times he flashed impressive control and command. His monthly splits were also impressive, including a 2.40 ERA in June. Considering the needs of the organization, and the depth of the starting pitching that will be at Iowa in 2019, Rucker could be pushed back to the bullpen, and that might be a good thing considering his ability to throw strikes at a higher rate. As a result, the guy who could be a guy could be a guy very quickly. The Cubs will lose about half their bullpen to free agency this offseason. There will definitely be some spots open and there are always arms needed every year. Rucker can fill one of those spots. As a starter, Michael sits 93 to 94. But coming out of the ‘pen, his stuff ticked up to 95-96 while at Myrtle Beach and South Bend. Theo Epstein has often professed his love for the pitchers who can throw strikes at a higher rate. That’s with Michael Rucker does, and he has a track record of doing it consistently and at multiple levels. The opportunities are there before him. The only question heading into next year will be whether the Cubs will give him the opportunity to pitch in relief at Iowa or if will they continue to have him start in the rotation. Rucker’s path to the majors could be greatly shortened as a bullpen guy. With his past experience in the ‘pen, it is not going require a lengthy time to transition to that role. He would be an interesting pitcher to put in that position because of his past experience relieving and his own ability to throw strikes.